This has got to be the most harebrained idea I’ve heard yet. I hope all of you will take a moment to write or call your representatives and tell them that they should be ashamed of themselves and most importantly, that you’ll be sure to note how they handle this situation now, when you go to vote next year. WASHINGTON — Taxing hybrids and other fuel-efficient cars and billing drivers for miles driven are among the approaches being suggested to avert a shortfall in money to maintain the nation’s highways. Less than four months after President Bush signed a six-year, $286.4 billion highway and public transit act, a report commissioned by the US Chamber of Commerce said that the federal Highway Trust Fund is running out of money and that Congress needs to think about new revenue sources. ‘’Decisions are going to have to be made in the very near future,” said Ed Mortimer, the business lobby’s director of transportation infrastructure, acknowledging it could be a tall order. The next highway bill is years away and lawmakers may be loathe to return to a measure that was widely criticized for being padded with thousands of special-interest projects. The Senate came to an acrimonious halt recently when a senator suggested shifting to hurricane relief the money from two Alaskan bridge projects, including a $223 million project linking Ketchikan to a sparsely populated island with an airport that critics have dubbed the ‘’bridge to nowhere.” Congress later removed the bridge from a list of protected projects, but money for it is still part of Alaska’s share of federal highway dollars. The recently issued study, commissioned but not endorsed by the chamber, estimated that the trust fund, financed by the federal tax on gasoline, will take in $231 billion over the six-year course of the act, and that the highway portion of the fund would hit a zero cash balance in 2008, a year before the act expires. The report also concluded that revenues from all levels of government will fall $500 billion short of what is needed just to maintain pavement and bridge conditions and traffic levels through 2015, and $1.1 trillion short of what is needed to improve the nation’s infrastructure. ‘’Without a significant influx of new revenues, our nation’s transportation network will also continue to deteriorate, impacting mobility and economic well-being,” said Stephen E. Sandherr, chief executive officer of Associated General Contractors of America. In the short term, the study recommended that the federal gas tax, set at 18.4 cents a gallon since 1993, be indexed for inflation. Of that, 15.44 cents goes to highways, with most of the rest to mass transit accounts. Last year, the House Transportation Committee backed raising the tax, the only major tax not adjusted for inflation, by 4 or 5 cents to pay for a $375 billion bill. The administration warned the president would veto any bill that increased taxes. The study argued that the fuel tax has lost one-third of its purchasing power since 1993 and that of the 60 cents per mile that drivers pay, 1 cent goes to federal taxes. Other possible short-term money-raisers include expanded use of tolling and bonds, closing fuel tax exemptions, recrediting interest to the trust fund, and dedicating 10 percent of US Customs import revenues to port and freight facilities. Proposals for the longer term could be more controversial. One is that owners of hybrids and other alternative fuel vehicles pay a vehicle fee, the argument being that drivers should bear their fair share to fill potholes and fix bridges, regardless of how much or what kind of fuel they use. photo/CALEN McKINNEY Dr. Jean Oostens, an adjunct physics professor at Campbellsville University, drives a hybrid Toyota Prius, which uses an electric engine and a gas-powered engine. Here, Oostens adjusts some settings in his car using its touch-screen computer. You can’t tell from the outside. From the inside, its two engines rest, waiting to be started with the push of a button. Capable of 40 to 50 mph in gas mileage, the car is called a hybrid and switches between an electric motor powered by a battery and a gas engine powered by gasoline. 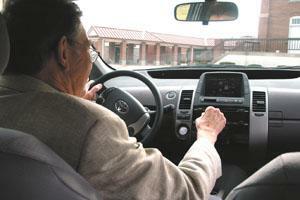 Dr. Jean Oostens, originally from Belgium, drives his 2002 hybrid Toyota Prius to Campbellsville University – where he teaches physics – from his home in Columbia. Oostens is also a research assistant at Campbellsville University. Oostens’ wife also drives a hybrid car. Most of a hybrid car’s functions depend on its computer, Oostens said, including the initial ignition, which brings the car to life with the push of a button. 1.5 liters. Most cars, he said, have 5 or 6 liter engines. The electric motor, Oostens said, has about 70 horsepower, which, when combined with the gas engine’s 76 horsepower, can produce speeds similar to gas powered cars. The car’s battery never needs to be charged, Oostens said, because it charges periodically when being driven. That function is also controlled by the car’s computer. Most in-town driving, he said, uses the gas-powered engine. Going downhill, he said, is an example of when the electric motor would likely take over. However, the car’s computer decides when to use gas and when to use the electric motor. Stop-and-go driving, Oostens said, uses a lot of the car’s energy. The car wouldn’t be good for driving in a high traffic area, Oostens said, such as California or New York, that requires many starts and stops. If the car should ever run out of gas, Oostens said, he’s been told the electric motor will take over and can run for about two miles. However, he said, he’s not ready to test that feature. The car also features lots of room for the driver and passengers and lots of storage in the hatchback, he said. Oostens said a hybrid car doesn’t require any special maintenance, other than routine oil changes and tire rotation and balancing. However, he said, whenever the car is worked on, technicians trained to specifically work on hybrid cars must do the work. Oostens takes his hybrid to a dealership in Bowling Green for any scheduled maintenance. Whenever maintenance is needed, Oostens said, the car’s computer reminds him with a message in English or French on the touch screen. Oostens said other hybrid cars are available from Ford and Honda, but he prefers Toyota’s hybrid. Oostens purchased his hybrid cars in Bowling Green and Louisville. The first car, he said, was much more difficult to find than the 2005 model, which he bought a little more than a year ago. The decision to buy a hybrid was made when Oostens needed another car besides a 1987 station wagon. “That’s enough of a reason,” Oostens said. When Oostens first wanted to buy a hybrid, many were available to choose from. The most recent car, he said, wasn’t easy to find. There was a waiting list to purchase a hybrid car, Oostens said, which required a $1,000 down payment. Oostens didn’t want to put money down on something he hadn’t even seen, so he didn’t add his name to the list. However, he got a phone call at home from a dealership saying they had one hybrid available. The only downside, Oostens said, was the car was black, which gets hot in the summer. Oostens said he thought this might be the only chance to buy a hybrid for a while, so he went to test drive the car. After the drive, he said, he wrote the dealership a check and took the car home. Hybrid cars, Oostens said, cost somewhere between $20,000 and $25,000. However, he said, those who purchase them get a tax break because the cars are more environmental friendly than other cars. The government, Oostens said, favors cars that yield a lower pollution rate. Being environmentally friendly was one reason Oostens decided to buy a hybrid. Saving money on gas was another reason. Oostens can drive about 400 miles before filling up his car. A hybrid car and a gas-powered car both drive well, Oostens said, but the hybrid car makes less noise. Oostens said he is starting to see more hybrid cars than he used to, though the cars are more common in Europe and Japan.